No. The issue is the Osirak reactor itself. stice with Israel back in 1949.
alion during the past year. ons in this year's campaign. Service Award to Murray J.
this award will pay tribute". Mr.
and board members for election. gelstein, Arnold J. Hoffman, Dr.
June 1983) Abe Bisgaier, Rev. ending June 1982) Cynnie List. man of the Missions committee. $1500 to the annual campaign. 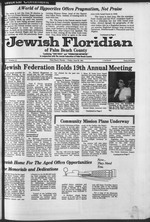 1981 Women's Division Jewish Federation-U J A campaign. ficers at the 19th annual meeting. Palm Beach County, presents an award of appreciation to Anne S.
faivus, out going Women's Division President. .uv.-,.on of Palm Beach County. "J¬ &Ay ,*//,<, rjf/ .fry Hotfoi "
urgent and growing needs of our Jewish aged. family name, or to pay tribute to departed loved PhM. CALL 832-2120 FOR FURTHER INFORMATION. Corps and President-Fleet of the Jewish Family & Children's Service. vish Federations, presents an award of recognition to Alan L. Shul- Coun*y '<* 1981-82.
an (or his work on behalf of the Jewish people. WaltzerwHha. award lor her rakae "
dent, passing the gavel to Mrs.
bility of producing atomic bombs. its atom bomb would also have been a danger to al. the Israelis a vote of thanks." ties. And on Baghdad's word. straint vis-a-visl a Russian nuclear presence in. enemy that no atomic belligerence was intended? Journal opines the Israelis deserve. And in our own, although we will never admit it. Israeli victory in the past. boardrooms of the world's "free"
key to a lasting Mideast peace." .nuch bigger feed later on. recognition to the State of Israel. ISN'T THAT just grand? Rep.
rael from within. The pure K0-. referred to him as "Yasir, that1. we'd better buy. Or else. with all of the amenities *miU. dren as well as adults every week. Adult home "live and learn"
Ellen Abrams, daughter of Mr.
Vlexu Kranz. daughter of Mr.
and Mrs. George Kranz: Gary S.
Lesser, son of Mr. and Mrs.
Shepard Lesser; Ilyse J. Phillips. Tochner, son of Mr. and Mrs.
they all spoke so eloquently." Cross Roads Bldg. 1897 Palm Beach Lakes Blvd. most suitable for the attack. oppostion leader to a similar a message for Sadat. INCLUDES: Glatl Kosher CulaMa. TV In All Rooms. Private Beach. Olympic Pool. Synagogue On Premises. you're in for a little shock. of being the lowest 80s Box. twice as much tar as Now! All tar numbers are av. per cigarette by FTC method. The lowest in tarqfaU brands. BOX. BOX 100'S: Less than 0.01 mg. "tar". 0.001 mg. nicotine. SOFT PACK 85's FILTER. MENTHOL 1 mg. "tar". 0.1 mg. nicotini. SOFT PACK 100's FILTER. MENTHOL: 2 mg. "tar". 0.2 mg. nicotine, av. per cigarette by FTC method. Hungarian Jews from the Nazis. grant was to Winston Churchill. Fairbanks added that the U.S.
ment and the request of the U.S.
signers to his resolution. Sen.
mittee can hold hearings soon. to so many others." he said. "was in this terrible century . and now we must act for him,"
between June 24th and July 1st. 2 winners will be selected at each office. Thursday July 2nd. m*ZLT*T $#'V,C* R#P'r,,Q,l,' h W how to fn<, th. .n.uronc. on you. Kivlng. to help you take off. I* MSt 01 PHI by ft CUSt:r*l ! * H"
wH slot* to cowr coupons must oe shown on request. =new baby daughter Jessica. Grandma Dora Pariser is beaming! |at Temple Beth F.l. June will usher in the wedding of daughter! | We know you will have continued joy from your children. |the Benjamin S. Hornstein Elementary School of the Jewish! | Tenzer, Jeffrey Tochner and Joan Werlinsky. : children and their honors so we can all share and kvell together. ! I there than the accomplishments of our children. the First Federal of Delray. August 11 at Bagel World. 85.75. Anshei Sholem at 1:30 p.m.
Heiss is hostess for the afternoon. \ The Mobile Sound Factory. . Loud Or As Soft As You Need Professonal D.J. Church (U.S.) the N. C.
program for inner city residents. two sons, Justin and Marc. 47M HRCMIH MVi.. WOT Ml* MAO. Just a note to say "thank you"
in the West Palm Beach area. and learning with Wynn Kenton. on the 6,13.20 and 27.
meets on Thursdays at 10 a.m.
. day of the month at 2 p.m.
for our Giant FTea M*i? July 27, from 10 a.m. to2pa. [took place Sunday, May 17th at Camp Shalom. SABBATH SERVICES FRIDAY fc00 P.M.
had a long meeting with U.S.
to wait some time, Waleska said. prejudge a matter of extreme complexity." any semblance of the impartiality required by his office." non-Arab members of the United Nations." with a friend and a good cup of Some" Brand Coffee. devotee to tiscestiea of rbeetei ene1 twee. question is indeed a statement. star to the human heart. feel at home in their new homes. in the synagogue of your choice. sional for over 30 years. Ronnie Kramer (793-2700) Sabbath services, Friday at 8:15 p.m.
Hall 4000 Washington Rd. at Southern Blvd. a.m. Daily Minyan at 8:15 a.m.. Sunday at 9 a.m.
a.m.. 7 p.m. Mincha followed by Sholoeh Seudoa. Thursday at 8:15 a.m., Friday at 8:15 p.m. Saturday at 9 am. Friday at 8 p.m.. Saturday 10 a.m.
at Faith United Preabyterian Church. 276 Alawairii Drive, hj"
days and Thursdays at a.m. Rabbi Joel Chazln Cantor David Dardaehtl Sabbath service*. at Colony Building, 1030 Royal Palm Beach Blvd.. l*>,,lhpL. vices. Friday night at 8 p.m.
land worked on the campaign,"
Bert Fields; Mrs. Richard G.
shall Brass, Arnold Lampert and Joseph P. Mandelbaum. Self Portrait of a Hero. the home of Muriel Lunden. Mord wai Richler. (Alfred A.
in the finest of Je**sh tradition. fact apparent to the Jewish community. AND THE OLDEST IN BROWARD COUNTY. a business it's a way of life. people should be genuine. It's your right, and our religion. With locations in Sunrise, Deerfield Beach and Margate.
. and the finest Florida seafoods. West Palm Beach, Florida 33401 U.S.A.